Strengthen the security of your photo ID program with the Datacard® Signature Pointe™ solution/software. It features all the tools you need to capture, store and print high-quality electronic signatures on individual ID cards, including a digital signature pad. Plus, an intuitive interface ensures exceptional ease of use. Delivers clear, accurate digital signatures. Manages your entire signature database. What are the best practices for securing your digitally enabled enterprise? Let us show you. The durable signature pad and tethered writing stylus ensure clear, reliable capture of digital signatures and deliver consistent, high-quality results. An integrated, interactive LCD panel shows users their handwriting as they sign, minimizing the risk of errors. 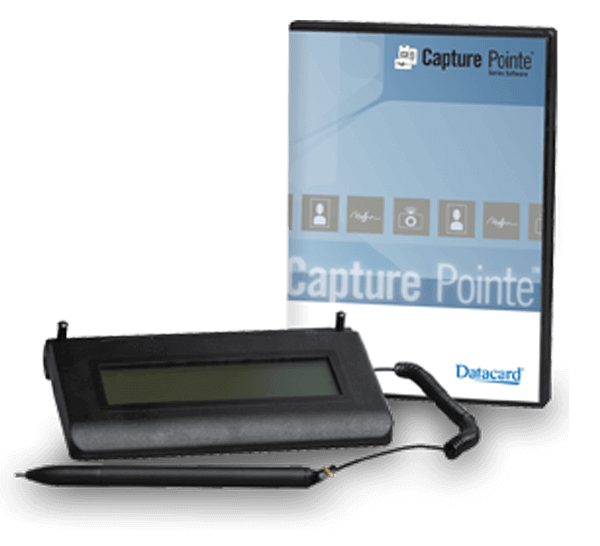 The Signature Pointe solution/software comes with Datacard® Signature Pointe™ solution/software, which integrates seamlessly with Datacard® IDCentre™ Silver identification software or Datacard® IDCentre™ Gold identification software. The Signature Pointe solution/software stores digital signatures in Windows® Metafile Format (.wmf) or Bitmap (.bmp) file formats, depending on your ID program’s needs. Launch Your ID card program with the right mix of affordability, security and simplicity. See How Entrust Datacard can Help.